Azerbaijani Foreign Minister Elmar Mammadyarov, who is on a working visit to China, met with the President of the World Economic Forum (WEF) Borge Brande, the Foreign Ministry informed on September 18. The meeting was held within the annual meeting of New Champions organized by the WEF in Tianjin, China. The sides noted with satisfaction the traditional ties established between Azerbaijan and the WEF. The participation and speeches of Azerbaijani President Ilham Aliyev in the annual meetings of the WEF were particularly emphasized. Azerbaijan’s participation in the current meeting on the threats facing the modern world in the political, economic and environmental spheres was highly appreciated. Mammadyarov noted that the growth of indicators every year on providing conditions and competitiveness for business activities and creating new jobs in Azerbaijan in the annual reports of the WEF on development of global economic trends and forecasting their prospects is not accidental. He stressed that thanks to these positive results, achieved through the reforms carried out in Azerbaijan and the ongoing development programs, stable and sustainable development is ensured. 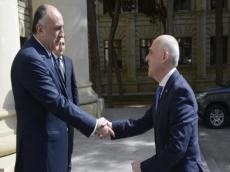 Mammadyarov added that in order to ensure more effective use of the rich potential of Azerbaijan for the welfare of the people, much attention is paid to regional cooperation projects. The minister also spoke about the importance of the East-West, North-South and South-West transport corridors. Touching upon the Armenia-Azerbaijan Nagorno-Karabakh conflict, he noted that the illegal presence of the Armenian armed forces in the occupied territories of Azerbaijan not only poses a serious threat to regional peace and security, but also hinders comprehensive cooperation in the South Caucasus region and in the wider area. During the meeting, the sides also expressed confidence that the traditional relations between Azerbaijan and the WEF will continue to develop successfully and exchanged views on the role of Azerbaijan in the global economy and other issues of mutual interest. The World Economic Forum, based in Geneva, aims to improve the state of the world by engaging business, political, academic, and other leaders of society to shape global, regional, and industry agendas. The Forum is best known for its annual meeting at the end of January in Davos. The meetings bring together some 2,500 top business leaders, international political leaders, economists, celebrities and journalists for up to four days to discuss the most pressing issues facing the world.